But I'm Still Here --- Carlotta from the Follies anthem song. There's only one problem with Julianne Boyd's ravishing, beautifully performed and still tantalizingly against the traditional grain revival of Stephen Sondheim's Follies. It's only playing until July 16th. After launching the endearing The 25th Annual Putnam County Spelling Bee on its award-winning journey to Off-Broadway, Broadway (nominations and awards included a Tony for best book and best featured performer, Barrington Stage has launched its 2005 Main Stage season with this splendid 75th birthday tribute to contemporary musical theater's most influential and groundbreaking composer-lyricist. In case you're not familiar with this show-biz saga, it's set in 1971 in an about-to be demolished theater, where impresario Dimitri Weismann -- a stand-in for the legendary Flo Ziegfeld -- his name like the show's title illustrating Sondheim's penchant for symbolic word play -- instead of wringing his hands because his delapidated theater is being demolished, throws a reunion party for the "Weismann Girls" who descended the theater's staircase in opulent costumes and danced up a storm in the Follies revues from 1918 to 1941. The first part of this at once tearful and joyously nostalgic party gives each of the guests a chance to step into the limelight for a musical reminiscence. The only real plot built into this conceit comes from two 1941 Follies girls, Sally and Phyllis and their husbands Buddy and Ben for whom the return to the theater exacerbates the marital problems that began thirty years ago when Ben left Sally for Phyllis, and Sally married the adoring Buddy. Follies is not an easy show to produce. The combination of song and dance filled reunion and marital drama, not to mention a second act vaudevillian fantasia about each of the unhappy wives' and husbands' "Follies" calls for a savvy director and a large cast of performers who must excel as singers, dancers and actors. The characters of the older actors and their younger memory-born selves must merge almost cinematically, without fadeouts or clearly defined scene changes. Though the set can be relatively simple, the costumes and choreography require a budget larger than most small organizations can afford to do justice to the sequences that evoke the 1918 to 1941 era of dazzling chorus girls and songsmiths who turned out song after great song. Those show-biz sequences are the deceptively bright wrapping paper for William Goldman's dark book in which the two unhappily married couples at the otherwise plotless show's center reflect an America (1971) which is filled with a sense of regret for its optimistic and settled younger days. 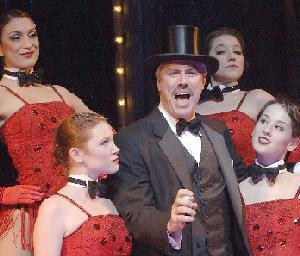 Small wonder that full-bodied Follies productions are rare enough for any major revival to be a destination for musical theater fans generally and Sondheim enthusiasts in particular. I was therefore not surprised to see many New Yorkers (including critics) at last Sunday's opening. Some of these Sondheimians have seen every major Follies production somce its multi-Tony Award winning 1971 Broadway premiere and to the Roundabout Theater Company's Great White Way revival in 2001. It would be too bad if some of these Follies aficionados allowed themselves to fall into the same trap as the show's Sally, Buddy, Phyllis and Ben who regret the perfect lives they once thought was theirs but fail to see that their laments about lost dreams keep them from moving forward. So take my advice. Ignore any comparisons. Boyd, having staged Company as well as A Little Night Music is quite a Sondheim aficionado herself. This third Sondheim venture is her best and most elaborate yet. It's got enough star power and and glitz to make you forget that you are in a high school auditorium. The Barrington Stage production uses the same Goldman text as the Roundabout revival (there are some five variations with none ever dubbed as the official one) and has re-arranged some of the original material. Most importantly, Boyd and her team, without turning the reconciliations into a sugar-coated happy ending, have offset the sadness of irretrievably lost innocence and youth with the overall spirit of survival summed up in Carlotta Campion's (Donna McKechnie) terrific "I'm Still Here." Kim Crosby as Sally singing the torch-y "Losing My Mind." Except for Jeff McCarthy as Ben, the erstwhile diplomat who no longer has a portfolio or the ability to connect with his wife, and Lara Teeter as the traveling salesman whose knowledge that his wife regrets having married him drove him into another woman's arms, this is mostly the Weissman Girls' show. Aside from being too young to be a totally convincing forty-nine-year old, Kim Crosby is a touching Sally with a beautiful voice. Leslie Denniston lets us see the aching heart beating beneath to cool, sophisticated Phyllis's exterior -- as does her urbane but distant husband (McCarthy) when his madcap vaudevillian "Live, Laugh, Love" turns into an anguished collapse. Lara Teeter Buddy is somewhat bland except during his spectacular Buddy's Folly turn. Of the other Weissman Girls, Donna McKechnie who you may remember for her Tony-Award winning star turn in Michael Bennett's A Chorus Line (the same Bennett who co-directed the first Broadway Follies) is a feisty Carlotta who's very much " Still Here." Marni Nixon (who's in recent years stepped forward from her "Voice of Hollywood " days to be a more visible stage presence) here joins her lovely voice with her younger counterpart (Michelle Dyer) for a moving "One More Kiss." The rest of the performers, including all the younger ghost figures, round out the cast's overall excellence. Leslie Denniston as Phyllis singing "Ah, But Underneath!" Boyd and choreographer Teeter have been particularly adept at seamlessly mingling the movement of the real reunion participants and the " ghosts" of their younger selves. Not having seen the Paper Mill Playhouse Follies which also had a set design by Michael Anania, I don't know how different this is, but I can tell you that the he's created a wonderfully atmospheric old theater. The use of a glittery curtain that rises and falls at the beginning and end of the Loveland and Folly scenes also works quite well. A standing ovation for Alejo Vietti's costumes that include towering head pieces with glittery gowns, shades of the Ziegfeld revues, and bright and brassy vaudevillian attire for the fantasy scenes. Of course, the super stars of this or any other version of this complex show are Stephen Sondheim's music and the lyrics that characterize and tell complete little stories. It would be your folly to miss this Follies. Performances are Tuesdays at 7pm, Wednesday and Thursday at 8pm, Friday at 2 & 8pm, Saturday at 8pm, and Sunday at 5pm, with a special Wednesday matinee July 13 at 2pm. Reviewed by Elyse Sommer based on June 26th press opening.